Lately I’ve been trying to build up some screencasts and found that the little RocketFish microphone I had was woefully inadequate. I had to doctor up the sound considerably with Audacity just to get it to come across reasonably well. My friend Bob (who happily shares his marketing expertise) let me borrow his professional setup, complete with a Tascam US-122, a Sennheiser mic, filter and large desktop stand. He used to do professional voice-over work and after getting it up and running the difference was simply stunning. Though I liked Bob’s setup, it was a little too much for my modest needs. Since I’m not an audiophile or accoustics expert I just wanted something that approximated the sound quality of a professional setup in a nice little USB based package. 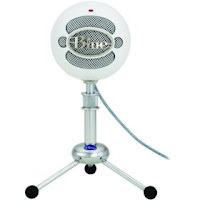 I hit up the local Apple store and the gentleman that was responsible for high-end creative applications said some good things about the Blue Snowball USB Microphone . I jumped up to Amazon and bought one. The Snowball looks kind of like a, er, Snowball on a small tripod. All I needed to do was plug it in then drop into System Preferences / Sound, select the Input tab and then choose the Blue Snowball as my device. There wasn’t much more to it than that. As far as sound quality goes I couldn’t tell the difference between it and the Tascam based setup I was using earlier. 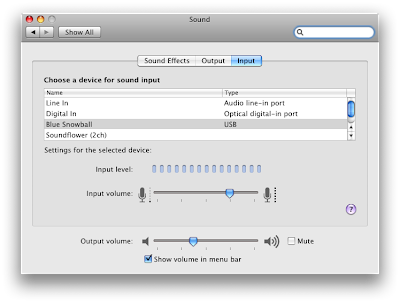 Again, I’m really just a layman when it comes to audio so to my amateur ears the Snowball sounded just as good. The Snowball’s stand is slightly adjustable. The top of the Snowball hits 9 inches at it’s lowest setting—which is what I use—and 10.5 inches at maximum extension. Just to round out (so to speak) the measurements, the ball itself is roughly 3.75 inches wide. If you are considering getting a Snowball grab a ruler and use those measurements to ensure it won’t block your screen if you want to use it like I am. My Samsungs are set at their highest level and this just makes it. This is a really nice piece of hardware; it feels extremely solid and comes with a high quality USB cable. The screencasts I’ve been working on suddenly got much better and my everyday uses for the mic have improved dramatically. When I made a call to a friend I speak to frequently on Skype and asked if he noticed a difference his response was "clearly". That summed it up nicely. Do you have a mid to high-end microphone setup for your Mac? If so, please drop a note with the specs into the comments.